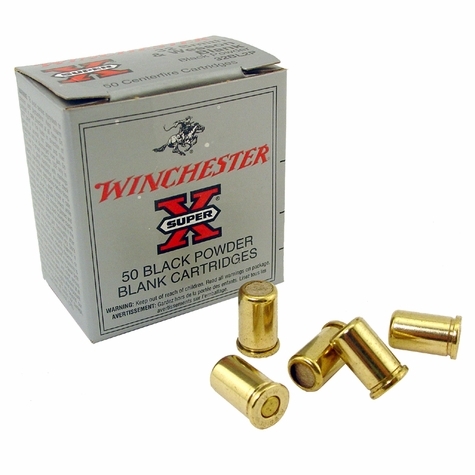 Winchester S & W .32 Caliber Black Powder Blanks -- 50 ct. $39.95. "Best of the .32 blank shells." Best of the .32 blank shells. I use them for starting track running events and have used other shells that don't have the same effect or consistency. They are loud, have a great flash, and rarely misfire. It is a shame that Winchester doesn't keep up with the demand, and that they are always hard to purchase. They will always be my first choice for use at track meets. "The Winchester Black Powder Blanks are the best you can get for blanks of this caliber"
"Glad to find a supplier for us." Glad to find a supplier for us. I use the blanks in the starter's gun for Cross Country and Track events as an official. These are the ideal shells for that usage. The primary problem is availability due to Winchester not maintaining production. Very loud compared to 22 blanks. Great for starting races. 32 cal. black powder blanks. 50 per box. Made in the USA.